This area is rich in history, boasting one of Japan’s oldest Shinto shrines and a section of its oldest road, as well as specialties like Miwa Somen and sake. The attractions are spread out, so rent a car or take advantage of the local buses, which have signage in English. Sake lovers should visit Nishiuchi Sake Brewery, a picturesque local brewery that offers tastings and tours. Ohmiwa Jinja Shrine is revered by sake brewers. Set in an ancient cedar forest, the whole complex has a mystical atmosphere. There is a legend that a white snake lived around the shrine, and you will see snake symbols, along with offerings of sake and eggs for the snake deity. Sakurai is famous for Miwa Somen, thin wheat noodles made with local spring water. One of the best places to try them is Morisho, in an Edo period house. There is a large garden area, where dishes are cooked on an open fire in winter. A short bus ride from Sakurai Station is Tanzan Jinja Shrine, renowned for its unusual pagoda, spectacular autumn colours and the part it played in overthrowing the powerful Soga clan. Nearby, Shorinji Temple houses a gilded Kannon figure, often compared with the Venus de Milo for its beautiful proportions. Mimuro Shiratamaya Eiju has been making monaka sweets for 160 years. Its flagship store is close to the main torii gate of Ohmiwa Jinja Shrine and has a simple tea shop overlooking a garden, offering tea and seasonal sweets. Ultra-fine somen noodles, much like angel hair pasta, are a go-to food across Japan, particularly in summer when hot weather subdues the appetite. 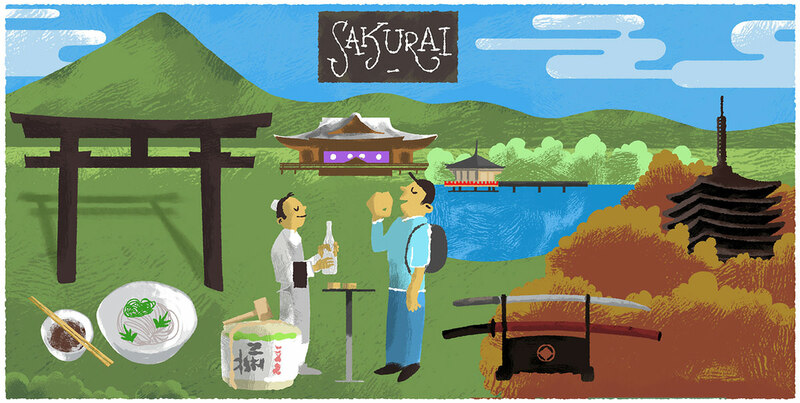 Nara, in particular Sakurai, is known as their birthplace, and the local specialty of Miwa Somen is especially popular. Cold Miwa Somen dishes and hot alternatives, known as nyumen, grace menus across the prefecture. Packs of bundled somen make great souvenirs and gifts. Nara’s own style of refined sake dates from the 8th century and was pioneered by local monks. Miwa is known as the birthplace of sake and brewers from all over Japan visit Ohmiwa Jinja Shrine to pray for good batches. The region also supplies the cedar for the wooden balls traditionally hung outside distilleries. Local breweries typically offer tours as well as tasting sessions. Around Ohmiwa Jinja Shrine, you will see offerings of sake and eggs. These are for the snake god who is said to reside here and have once loved a human princess. A white snake is currently supposed to live inside the ancient cedar near the centre of the shrine. With breathtaking fall colours at Tanzan Jinja Shrine and freshly brewed sake available at local breweries, autumn is arguably one of the best times to visit Sakurai. For treats like sake-flavored ice cream and somen, try summer. If walking is your thing, the Yamanobe-no-Michi trail between the towns of Sakurai and Tenri is a fun option for one of the warmer days in winter or in spring. The Sakurai area is served by two train lines making train travel a viable option to get around. Tanzan Jinja Shrine however is only accessible by bus or taxi. Buses depart from the south exit of Sakurai Station. A taxi from the station will take about 20 minutes and cost around ¥3,000. Sakurai Station is the main rail hub serving the Sakurai area and buses to nearby Tanzan Jinja Shrine leave from here. Check timetable information in advance at a tourist information centre as buses do not run every hour. For a wider range of lunch options, and to try Miwa Somen, consider eating near Miwa Station instead of Sakurai. Sakurai Station is the main station serving the Sakurai area. Direct from JR Nara Station, it takes a little under 30 minutes. For Ohmiwa Jinja Shrine, get off the train one station early at Miwa Station.